Availability: Second hand or GamersGate. 3 CD US version, or 1 DVD international. I’ve rambled on before about how fantasy themes used to overwhelm video games, and how fantasy in general has never exactly buttered my bread. So when someone describes a game as “Diablo with guns” – a common statement when this game was released – it might sound dismissive to you. But to me? It’s like saying “we’ve taken Diablo and made it cool.” We’ll get to whether they succeeded in a moment. Restricted Area takes place in a dark, cyberpunk future in the style of William Gibson. Corporations rule the world, while a token government force maintains the appearance of keeping them in line. Much of the Earth has been turned to irradiated wasteland, and the remaining crowded urban areas are a mix of smoke, shadows, and backdoor dealings. 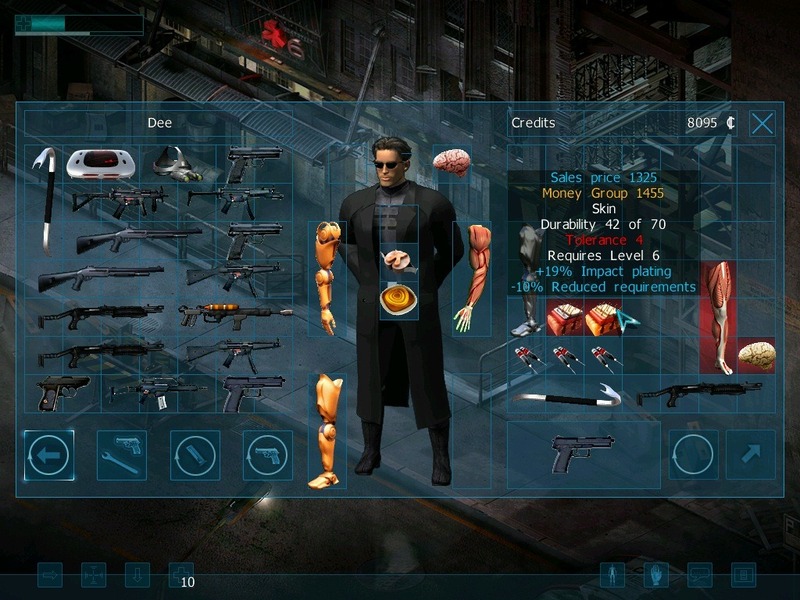 You play as one of four mercenaries taking odd jobs from suited representatives of the six major corporations. Some of the playable mercs are out for money, some to escape from their past, but all are looking for a new life in the lucrative field of dirty deeds done dirt cheap. The structure is pretty straightforward. A barricaded city block acts as a mission hub, and features access to weapons dealers, doctors, and loan sharks. One mission contact provides you with the next story quest in a linear plot, while the other acts as a “job board” with randomized side-tasks you can take for more money and XP. 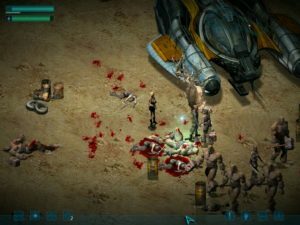 As you progress through the plot missions, you’ll run afoul of the one corporation everyone is afraid to cross – Oxygenetic – as well as get cameo appearances from the three mercs you didn’t choose to play as. It’s certainly a looker, and sharp textures with a consistent sci-fi theme create a dingy atmosphere worthy of the cyberpunk term. 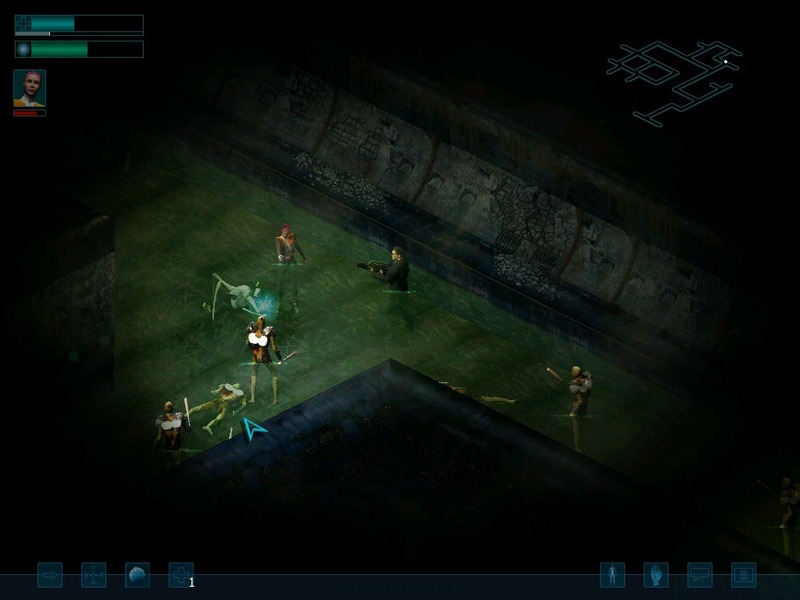 Graphical options are limited, but you can engage flickering and dynamic lights, which help with shadows, strobes, and the occasional colored light (usually red). Many bunkers are dark, and in these areas, your mouse cursor acts a flashlight to shine around and spot monsters lurching from the dark. There’s also a fair variety of locales in the story missions, but the job board missions definitely reuse the same bunker tile sets over and over. Animations for everyone are somewhat stiff, but rarely distracting. Some limited physics shoves barrels around when they explode, which has useful gameplay implications, but that’s as advanced as it gets. Gameplay is straightforward Action RPG. Your basic actions are a left-click to move and a right click to attack, though all three mouse buttons can be customized to a limited degree. Killing every creature nets you some experience used to increase the skill points of your character, and treasure chests in the level offer the potential for cool loot that does the same. Excess or unwanted gear is sold back at the city hub for cash monies. And if you happen to have an interested buddy, you can rock and roll through the game together in networked co-op. Victoria chucks Psi projectiles along with her bullets. The difference here is the focus on ranged combat. Guns are the weapons of choice in Restricted Area’s world, and while there is one (and only one) character that has the option to use a sword, all others need to pick from pistols, shotguns, or automatic weapons. Each of the three types has its own skill branch (promoting specialization), and break out as you would expect – SMGs are fast but weak, shotguns are powerful but slow, pistols sit somewhere in the middle. Many foes don’t have ranged attacks themselves, so the balance of combat is often in your favor – though you’re still plenty screwed if you can’t maneuver and end up surrounded. All guns have unlimited ammo, so your only concern is finding the one that boosts your stats in a way you approve of. 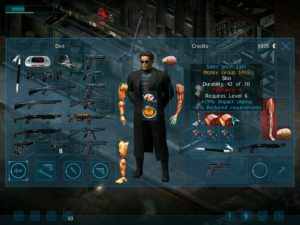 Since everyone’s using the same pool of guns, character specialization comes from the unique skills each of the four possesses. Johnson is a gruff man-in-black, and the least complicated of the group. He’s the only character that can equip flamethrowers and plasma rifles (both advanced ordinance), and his unique skill tree focuses on damage reduction, critical hits, and tolerance boosts. Victoria is the “mage” of the group, sporting psionic powers that pull from a recharging energy pool. Her skills introduce new psi attacks and shields (in addition to her guns), and increase their effectiveness and reduce their costs. Kenji is a yakuza on the run, and can focus on either melee weapons or dual gun attacks, along with some martial arts attacks. Jessica is a hacker with a pet laser drone, which can be activated to attack foes at the cost of draining energy. Jessica is also the only character than can enter cyberspace (a ghostly techno version of the current level), where she can pull charge points for her abilities or regain energy for her drone. Like the original Diablo, strategy isn’t as important as the stats on both your character and their gear. Dodging attacks, for example, is a passive skill invoked automatically by your character’s reflex value. You won’t even see an animation signifying a successful dodge; your character simply ignores whatever attack connects. Similar story when attacking an enemy and not having a high-enough accuracy stat. This leads to combat feeling a bit bland – an issue I have with nearly all numbers-heavy ARPGs. You simply move forward, click to kill everything in sight, and repeat. Challenge is offered in the form of tougher enemies, boss fights that lock you into the same room, and enemies with ranged weapons of increasing power. These all keep you from simply wading in and holding down the “win” button, but instead of promoting strategy, they simply require you to keep advancing your skills and stats to overcome them with literal numbers. This is where those side-missions come in. I hesitate to even call them side missions, since the game’s structure requires you to grind on them until you’re at a level worthy enough to take on the next story mission. This can take a while. All side missions take place in bunkers with randomly-generated layouts and a cadre of enemies within. 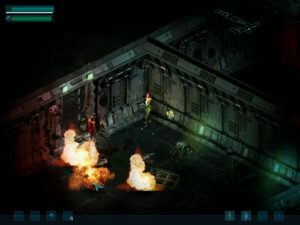 Missions essentially break out into two types: fight down to the level with the objective (allowing you to “rush” through as much as you can), or meticulously explore the levels and kill every mutant within (for which you are paid per kill). I suppose it allows for two different play styles, but as the levels only automap as you run through them, you’re killing a whole lot of monsters anyway. Might as well get a bonus paid for each and every one. The game also features no “town portal” spell, meaning there’s no way to freely return to the hub and sell the accumulated crap in your limited inventory, then immediately and painlessly return where you left off. There is a way to return to town – forfeiting the mission – which makes you lose “reputation” points each time you do it (same if you are killed). Your rep points determine the quality of missions you get, so dying often or aborting missions keeps you doing scrub work for low pay (to be clear, the missions are functionally the same, but higher difficulties bring higher rewards). Story missions often give you an A.I. buddy. You otherwise have the option to run all the way back your ship and dump extra inventory off to the cargo hold. Bunker levels you’ve cleared stay cleared, but you will have to fight your way back around the surface level; and, of course, make multiple selling trips when you’re back in the city. I’m the kind of player that HATES leaving gear behind (even a piddly little starter pistol is leaving money on the table), so having no way to easily dump it off particularly ground my gears. At least there is an “auto-sort” button in the inventory, so you won’t have to play “inventory Tetris” to get everything to fit. So it’s fair to say that Restricted Area gets repetitive as all hell, made worse (in my opinion) by forcing randomized, plotless side missions that simply scream “busy work.” But is it worth the trouble? Surprisingly, those story missions are pretty great. Not only do they have their own cutscenes and different branches, but the crossovers between character stories work out pretty well. You can expect to play most interactions from both sides if you go back and play through the game as both characters. There are also missions referenced in one campaign that are playable in another’s (so you get to see what Victoria is up to when she disappears, or perform the hack that Kenji requests). Each character also has a few exclusive missions, even playable flashback missions with very different situations and gear than the usual, all of which add value to playing through all four stories. It’s up to you if you have the patience for it. Restricted Area’s fault is not in cloning Diablo, because it does this competently. It takes the best parts of a solid gameplay system and pulls off their execution well. Its fault isn’t in being too generic or average, because the story is actually fairly creative and engaging. There’s even legitimate incentive to play through as each of the four characters. Its fault, hands down, is the grind, which to me just feels like lazy padding. However, I have a particular aversion to obvious busy work in games. If this doesn’t get you down – or if the endless quest for better loot and skills drives you enough to overcome it – Restricted Area is a pretty fine action RPG that’s a worthy alternative to the fantasy genre. Four different characters through both skills and story. Solid mechanics. Looks great. Few story missions, heavy emphasis on repetitious “job board” missions. Potential to get stale quickly. It’s nice to discover a cyberpunk-themed “alternative to Diablo”! What about the (in)famous “respawn” thing? Diablo 2 was guilty of placing back every single enemy – even bosses! – inside the areas you’ve had already cleared, and it was sooo painful to return into mission (after selling your loot, at the town) and find all of them on your path – again! And AGAIN! I quitted to hope to finish that game, only because of that terrible developers’ decision of the epoch, and would certainly not like to repeat the experience! Otherwise, this one game, seems good to me. Thanks again for your commitment! Yes and no. All missions are instanced, so you’ll never return to the same location later. There’s no “town portal” spell, so to head back to the hub, you have to either forfeit the mission entirely or run back and use the extra cargo space in your pilot’s ship to store items. If you forfeit, the mission (and location) stays in your log, but all enemies respawn when you try again. If you head back to the surface, then the facility levels you’ve cleared stay cleared (yay!). However, the surface level where the pilot waits will always have aggressive wastelanders roaming around. Still, not as bad as having every level repopulate when you return. The graphics reminded me something from the Unreal engine, but it could be just my impression. Still, nobody can see the facial expressions of the protagonists, even when you use zoom-in and zoom-out during the gameplay. The last, unfortunately, comes with the same damned saving sistem from the Diablo frinchise, making it even worse with having your (precious?) Prestige points cut down after every death or retreat, which is pretty frustrating. Also, you can’t reload with your best equipment, since the game automatically saves your stats (for good or bad for what you carry on you), after a return to the town caused by your conscient choice to retreat from the mission or by your alter ego’s plane death. Mantainig good things also becomes harder with “autosort” button, which gambles you with items placing: yes, it is comfortable, but more than once I pressed it, then went to the specialist in weapons of the town and discovered of selling her my best bits, because of the automatic arrangement that replaced them with the less-heavy-on-tolerance-requirements and weaker-on-effectiveness items – those that were supposed to be sold in the first place! So please, keep an eye on what you do with that button! To be fare, there are things that play in gamer’s favour. To name a few, you can make a deal with pilot, so he can reduce his percentage to a minimum for transporting you and your loot; the specialist can enhance your weapons, when available, without searching for specific equivalent of stones to be cast in (there are limits, too, but your money make those more elastic); you rely on distant shots, mostly, so it’s a winnning ability for every single character; you can rearrange your mouse buttons to perform more tasks, without involving the keyboard; the overall atmosphere is great – for those who love cyberpunk, it’s a manna! Still, it’s just like you said, J Man: it requires more and more of dull and, sometimes, helpless grinding, which is harmful for the little time, dedicated to fun, that many of us have during the day. Ah! You picked the game up! I was going to mention the auto-equip (or “best equip”) button, but dropped it in one of the revisions. I appreciate that it’s there, but after trying it a few times, I pretty quickly didn’t agree with its choices. Same issues you were having. You can indeed negotiate with the pilot. In fact, the female characters can negotiate an even better deal. You’ll also want to check back with the vendors in the city after every story mission – they’ll eventually have side tasks that give some pretty nice rewards. Hope you enjoy the rest of it!